Funny story, actually. I was at my very first-ever convention, all the way back in 2013. The phenomenal Jennie Goloboy had just plus-one'd me into the SFWA party suite, and I was keen to flex my neonatal networking muscle - so I asked her what she was trying to sell. "Well," she said. "I have this one client, Dan Bensen. He's written this time-travel romance called Groom of the Tyrannosaur Queen, and..."
I don't actually remember anything she said after that. The mere mention of that title shut my brain down like an EMP going off in the middle of Manhattan. And now, three years later, it is actually, really a real book: written, illustrated (ILLUSTRATED! ), printed, and published. 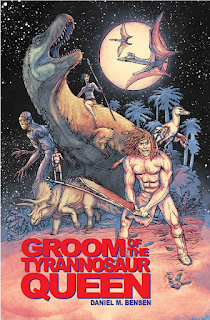 And here, today, the Tyrannosaur Groom himself will expound on - what else? Trals Scarback, war leader of the Ethlek, has an opportunity and a problem. The opportunity is a weapon of otherworldly power that fell out of the sky. The problem is Andrea, who claims to be a soldier from the tomorrow of tomorrows. The weapon, her powersuit, will only work for her. Plus, she has killed several of Trals's men. Trals's tribe is of two minds: either the foreign woman is war booty or she is an enemy warrior and should be killed, her hair flown from the poles of the tents of the women of the sons she killed. If Trals wants the use of Andrea's powersuit, she must officially join the tribe, so she is no longer an enemy. And there is really only one way to join an Eethlek tribe. The following is a description of an Eethlek marriage ceremony. If the woman is foreign, she must apply to the Leader of the tribe, the one who leads its triceratops herd who commands raiding and gathering parties beyond the boundaries of the camp. If he (leaders are almost always men) agrees that his warrior deserves to be a husband and father, the marriage proceeds. If not, the woman if free to choose some other man in the tribe. Then the Driver, the one who drives the herd from behind and governs within the boundaries of the camp, must agree that the tribe has enough resources to support a new member. The woman gives up her possessions to the tribe, and in return gets all the necessities to start a new life with her husband: a tent, a pot-sack, heating-stones, leather robes, metal tongs if she's lucky, and a triceratops, chriostenotes, or raptor egg depending on the season. Then the tribe's Revalatee holds a public trance, and its Sayer interprets the revelation for the congregation (it's almost always a blessing for the marriage). 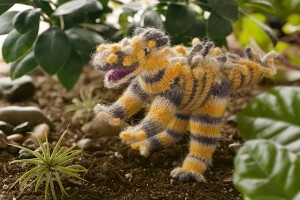 one of the dinosaurs in question. Finally, each newlywed cuts off a lock of their hair and braids it into the hair of the other. They retire to their new tent, where they summon the angels of the heavens to take up residence on the Face of God. And that's where babies come from. Groom of the Tyrannosaur Queen is a time-travel romance with dinosaurs. Former soldier Andrea Herrera isn’t happy with where her life’s taken her. Specifically, to Hell Creek, Montana, 65 million years before the present. As far as careers go, making sure the dinosaurs don’t eat her paleontologist clients comes in a pretty dismal second choice to serving her country. But when their time machine malfunctions, Andrea and her team are trapped in a timeline that shouldn’t exist with something a hell of a lot more dangerous than terrible lizards: other humans. Need more help? Well, look no further - because dinosaurs can fix your everything!